Greetings friends and fellow crafters, LeeAnn here with my project for the Joy Clair Inspirational Challenge. My project came about in a strange way, and it hit me quick. I was looking through my Joy Clair Stamps for a particular set, and came across this one from March 2016 and said PERFECT!!! This Sunflower layering set I knew would match up for the Layering Theme and the colors would lend itself perfectly. The inks used are all Memento Dew Drops Dandelion, Cantaloupe, Tangelo, New Sprout, Rich Cocoa and Summer Sky. I used the Darice Clouds embossing folder, ran the Summer Sky over the top side and placed my 4 x 5.25 piece of Recollections 110 lb card stock and ran it though my big shot. This enabled the background to accept the Summer Sky color and left the clouds white. For the Sunflower I used the Dandelion on the bottom solid layer, followed by Cantaloupe on the 2nd layer and Tangelo for the top. I then used New Sprout on the solid center layer and Rich Cocoa for the seed layer. Sentiment is stamped using Rich Cocoa and New Sprout is used around the edge of the tag, with some gold jewels to add a little bling. I hope you have enjoyed my project today, and that it has given you a bit of inspiration to work on a project of your own for our challenge. Remember you have until 8/31 to enter. If you have read this far, let me say how excited I am. This post is my 200th post on my blog. I started this blog July 15, 2015, just as a way to keep track of my projects and gain inspiration to keep working. I then joined my first design team in October 2015, and was very excited to receive an email in December 2015 inviting me to be a member on the Joy Clair team. The past 19 months have been awesome, and I hope to be with this team for much longer. The friendships we have made and the feedback we give each other, the camaraderie and just overall fun. And since I am celebrating my 200th post, I would like you to celebrate with me. One lucky winner has the opportunity to win a Joy Clair Stamp Set, All you have to do is tell me which one of my Joy Clair projects is your favorite. WARNING... I have made 98 posts using Joy Clair stamp sets in the past 19 months. 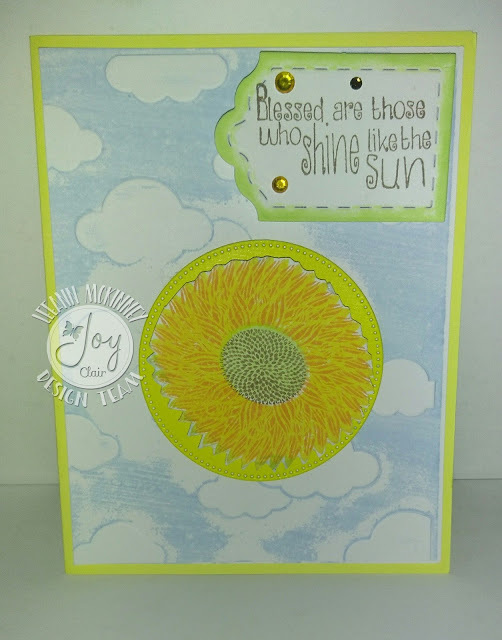 Love that beautiful sunflower and the sentiment on your card!